through my hands: Are you reluctant to purchase a fabric cutter? Are you reluctant to purchase a fabric cutter? I've been an owner of an AccuQuilt fabric cutter for about five years. I started off with the Go cutter which I still own and love. Last year, I purchased the electric version called Go Big and I have not looked back since. In fact, I'm considering selling my Go cutter now because it sits quietly and is not being used like it should. 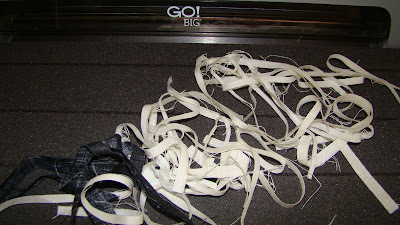 My reasons for purchasing a fabric cutter are many, but my primary reasons were more accuracy and faster cutting. I put off purchasing one for many years because I heard and believed all of the stories about fabric waste. I dislike waste as much as anyone and stalled each year until there was a sale that I couldn't pass up on and took a chance. When I purchased it, there were very few help videos available and no one locally taught anything about them and the best practices for use. I have since found what works best for me and I have very little waste. As far as the cost of the dies, yes, they can be expensive but so is your time and if you are finding that your cuts are just a little 'off,' and have been struggling with blocks being too big or too small, you will gain back your sanity and enjoy creating again. I look for sales and am selective about which dies I buy. Strip dies are worth the cost to me because I can get the most bang for my buck so to speak. However, if you find that you use a lot of a specific thing (i.e., hexies, half square triangles, 2 inch squares), you may benefit from purchasing a specific die for that purpose. I use A LOT of hexies and purchased a die that has three different sizes on it. I used that die for over 10,000 cuts before I killed the smallest size and had to purchase another one. And the die still works well on the middle and large hexie. That is the only die that I have had to replace in all these years. If you are like me and have issues with your hands, you would love having the electric version of the cutter. Even my husband notices that I am able to sew more now that I have the Go Big electric. Actually, he was the reason I purchased the Go Big because he encouraged me to preorder it before it was even available. On some of the strip dies, I would ask for his help in turning the handle because my hands and wrist just don't have the mobility that they once had. The electric version pulls the die through all by itself so it really does do all of the work. And if you pre-measure the width of the die and cut your fabric accordingly and fan fold, you can see from the picture above that there is very little waste. I don't even cut the fabric with a rotary cutter now. I just use a blue wash away pen and mark every so often and cut with my big scissors. I also steam the fabric once it has been fan folded and the cuts come out perfect every time. So if you've been on the fence, please find someone who has a cutter and has used it so you can get familiar and find out if it would be a good addition to your tool chest. If you are able to find a class, you will learn even more. I teach locally and have had many students who owned them but never used it or used it but wasn't comfortable. It is really helpful to learn tips and tricks for best practices. I hope this post helps someone who may be on the fence like I was on whether a cutter is something you will use and love. Okay, it's time to get back to sewing borders on the BOM blocks that I'm teaching.